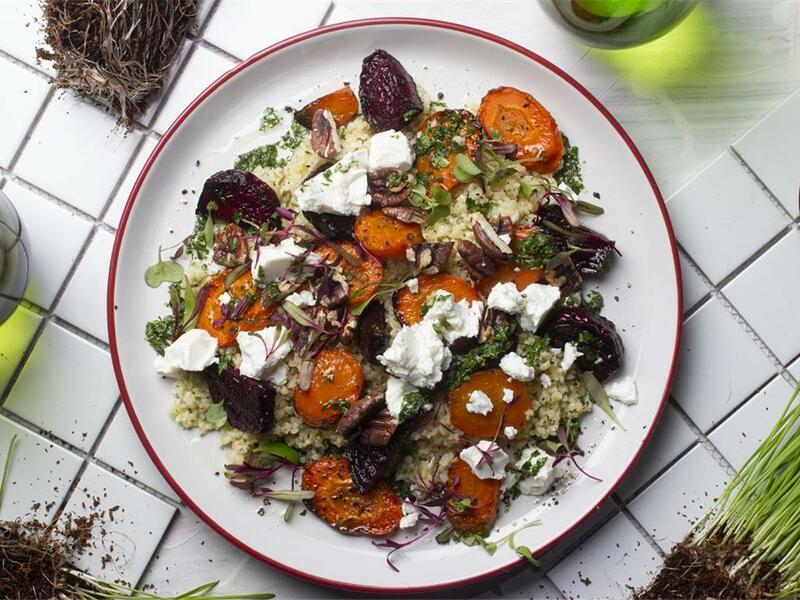 Bulgur wheat coated in a parsley mint pesto topped with roast carrots, beetroots & pecan nuts. Preparation: Preheat the oven to 200°C. Boil the kettle. Prepare all ingredients as indicated above. Parsley pesto: Mix together the parsley, mint, garlic, lemon zest and juice. Whisk in the olive oil (2 tbsp for 4; 1 tbsp for 2). Beetroots, carrots & nuts: Place the beetroots and carrots on a tin foil lined baking tray with a drizzle of olive oil and season with salt and pepper. Mix and arrange in a single layer and roast for 35 minutes until crispy and golden. In the last 8 minutes of cooking, place the pecan nuts on a separate tray to toast. Once toasted, chop roughly. Bulgur wheat: Place a pot on medium-high heat and add boiling water (2 cups for 4; 1 cup for 2). Add the wheat and boil gently for 10 minutes until tender. Drain and season. Parsley pesto: Chop the mint leaves finely then mix them with the parsley, garlic, lemon zest and juice. Whisk in the olive oil (2 tbsp for 4; 1 tbsp for 2). Serve by mixing ¾ of the parsley pesto through the bulgur wheat, and top with the roast veggies and toasted pecan nuts. Drizzle over the rest of the parsley pesto. "The barley was a bit tpo tart from the basalmic vinegar but otherwise the dish was good "